There are hundreds of temples in India dedicated to Raghavendra Swamy and almost each temple has its own tale to tell of the munificence and miracle of the Mantralaya seer. Of all the cities, Bangalore perhaps boasts of the highest number of temples dedicated to Raghavendra Swamy. Bangalore also has three Raghavendra Swamy temples that are under the direct control and management of the Nanjangud Sri Raghavendra Swamy Temple or Mantralaya Matha. All the Rayara mathas are holy places as the miracles and Mahime of Rayaru can be felt everywhere. However, some temples are sanctified and are holy by the very presence of Raghavendra. There are temples where Rayaru himself came to the aid of the bhaktas or devotees who wanted to construct a temple for him. One such temple is in Papparapatti in Tamil Nadu, which today is known as Dakshnina Mantralaya. Papparapatti is a small village about 15 kms west of Dharmapuri in Dharmapuri district of Tamil Nadu. The village is surrounded by lush green forests. It is on National Highway No. 7. The Brindavana here is a Mrithika and Saligrama structure. It means that the mrithika and saligramas from Mantralaya were brought here and installed in the Brindavana. Apart from Brindavana, you can also see Mukhyaprana temple on the Matha premises. The Matha has been described as Dakshina Mantralaya by none other than the then Swamiji of Mantralaya Matha, Sushemendra Theertha. It was February 21, 1996 and Sushemendra Theertha was to arrive at Dharmapuri for the consecration of a Brindavana of Raghavendra Swamiji there. The Aasthika Samaja requested him to come to Papparapatti also. The Swamiji agreed but said he would be able to spend only a short time at Papparapatti. He also made it clear that he should not be persuaded to extend his stay. He then came to Papparapatti the same day. He performed pooja and stayed at the Matha for two days. During his discourse, Sushemendra Theertha declared that the Matha would develop into Dakshina Mantralaya. Since then, this name has struck to this temple of Raghavendra Swamy. The matha provides accommodation and Theertha prasada. It is near Hogenkal which is 35 kms away. Palakkodu is about nine kms away. There is an Agrahara of Madhwa community near the RaghavendraSwamyTemple. On the National Highway No 7, near Krishnagiri is the temple of Pranadevaru consecrated by Vyasaraja. It is called Kad Anjaneya. Papparapatti is on the Bangalore-Salem route. The village is about 100 kms from Bangalore. This is the first ever Brindavana in the world which was installed following a direction from Rayaru himself. This is the Eka Shila Brindavana in Bichale, which is near Mantralaya. While Mantralaya is in Andhra Pradesh, Bichale is in Raichur district in Karnataka. Both Mantralaya and Bichale are on the banks of the Tungabhadra. The Brindavana at Bichale is perhaps the only one without a temple or matha surrounding it. The Brindavana is constructed in the Japada Katte on the banks of the Tungabhadra and it was completely covered by the floor waters of the Tungabhadra in 2009. What makes this Brindavana special is that Rayaru himself came in the dream of Appanacharya and asked him to construct the Brindavan. This is how the story of the Brindavana unfolded. Appanacharya went to Mantralaya every day after Rayaru entered Brindavana in august 1671. One night, Rayaru came in his dream and asked him to construct a Brindavana at Bichale itself. “You are old and it is difficult for you to come and see me everyday in Mantralaya”, Rayaru told Appanacharya. Rayasu then chose the Japada Katte and asked Appanacharya to construct the Brindavana at the spot. Appanacharya constructed the Brindavana and he spent his last few days before it, composing hymns and stotras. Rayaru had a reason for specifically choosing the Japada Katte. It was at this place that as Vyasa Raja, he had consecrated the Hanuman idol. Besides, Vibhudendre Theertha, Jitamitra Theertha, Sripadaraja had spent time at the Japada Katte and left their imprint. Moreover, the Japada Katte ws the place where Appanacharya operated his Veda Patashala and Gurukula. It was also the place where Rayaru wrote his Parimala, thus earning the name Parimalacharya. Rayaru and Appanacharya had spent years at the Japada Katte discussing scriptures and discussing many aspects of religion and philosophy. Hence, Rayaru wanted the Japada Katte to host his Brindavana. This is the first Eka Shila Brindavana of Rayaru and the first outside Mantralaya. The fact that Rayaru himself asked Appanacharya to build a Brindavana is significant. Appanacharya, in his earlier avatar, was a brother of Prahalada, an avatar of Rayaru. Appanacharya passed away in 1674, three years after Rayaru entered Brindavan. Even today, the Brindavan is worshipped every day with a Hanuman idol placed atop it. One of Appanacharya’s descendents, Badadha Ramacharya Bichali, is conducting the pooja. He also tells visitors and pilgrims about the holiness of Bichale, the history of Japada Katte and the deep and everlasting friendship between Rayaru and Appanacharya. Even today, the Japada Katte draws crowds of eager tourists and pilgrims. Almost all Madhwa saints and all the Haridasas right from Vijaya Dasa to Jagannatha Dasa, Karaji Dasa to Guru Jagannatha Dasa, Pranesha Dasa to Mohana Dasa, Gopala Dasa and his three brothers all of whom were Dasas and hundreds of them have visited Bichale and sang praises of Rayaru and Appanacharya, their friendship and the holiness of the Japada Katte. He was the pontiff of the Sri Mantralaya Matha or the Sri Raghavendra Swamy Matha a hundred years after Raghavendra Swamy. He is even today acknowledged as one of the finest and most scholarly pandits to occupy the high seat. A scholar par excellence, he is credited with putting Mantralaya back again on track. He was honored by several Kings and gifted lands. The Peshwa too was a devotee. He was known for his pooje to Moola Rama Devaru. He got several record of the Matha and its land regranted. He also introduced a seam with a sloka which is used by the Matha even today. He had a deep and abiding desire to see Raghavendra Swamy in person. This desire became all the more strong when he was told that Rayaru was giving darshana to a humble villager and that he was also speaking to him regularly. The pontiff asked the villager to interceded on his behalf with Rayaru and ensure that he too was given darshan. Try as he might and intercede as much, Rayaru refused to agree too the pleas of the villager to give darshan to the pontiff. When Rayaru finally relented, the pontiff could not control his sleep and he dozed off, only to wake up and see the orange ochre robes of Rayaru as he reentered the Brindavana at Mantralaya. This is the story of Bhuvenandra Theertha, the successor to the Sri Raghavendra Matha after the redoubtable Dheerendra Theertha. Bhuvanendra Theertha was the pontiff of the Sri Matha from 1785 to 1799. The Mantralaya Matha itself acknowledges that Bhuvanendra Theertha was a seer of great intellect. He acquired the administrative acumen from his guru Varadendra Theertha and scholarship from Dheerendra Theertha. Besides he was also known as a patron of Haridasa literature. The Peshwas of Pune respected him as did many other Kings. The ruler of Gadhwal, Seetharam Bhoopala, the Nawab of Hiremoraba, Mir Mohammed Shah Jung, the King of Surpur and the Desai of Nagaladinni, Khiravala Nayaka and Somashekara Nayaka of Benkapura gifted him lands and several villages. One day, the pontiff was told by the matha officials and some disciples about how Rayaru was giving darshana in person to a villager from Matmari or Matamari. Matmari is a small village near Mantralaya. It is on the Raichur-Guntakal railway line and it is located in Raichur taluk of Raichur district in Karnataka. There was a devotee of Rayaru in the village called Benagappa or Benkappa. He used to visit Mantralaya regularly and sit in meditation before the Brindavana. He made it a point to visit Mantralaya every Thursday without fail. Several years passed and the youth grew old. Yet, he continued visiting Mantralaya every Thursday without fail. Rayaru was pleased with Benkappa’s devotion and one Thursday he rewarded Benkappa by appearing in person. Benkappa was speechless when he saw Rayaru emerging from the Brindavana. The speechlessness turned to awe and wonder when he saw Rayaru speaking to him in a loving manner. Slowly and over a period of time, the Thursday interaction between Rayaru and Benkappa turned into a question and answer session. Benkappabegan telling Rayaru about the problems and Rayaru set about advising him about the best course of action. Neighbours, friends and relatives soon realised that Rayaru was speaking to Benkappa and they came to him with their problems. Tell our problems to Rayaru. We will follow whatever he says,” they said. Rayaru, in turn, answered each query patiently. He seemed to have answers to all the problems that Benkappa placed before him. Soon, Benkappa’s fame spread far and wide and even the matha officials came to know about it. The then pontiff of the Sri Matha, Bhuvanendra Theertha, was told about the interaction between Benkappa and Rayaru. The pontiff then summoned Benkappa and asked him about the interactions. Benkappa admitted to the pontiff that he saw Rayaru every Thursday and spoke to him about people’s problems. He said Rayaru solved people’s woes and also suggested solutions. The pontiff further questioned Benkappa and he was satisfied that the villager indeed was talking to Rayaru. He then asked Benkappa for a favour. “Please request Rayaru to give me darshana too, I would like to see him”, he said. Benkappa was flabbergasted. He could not believe his ears that the pontiff of the Raghavendra Swamy Matha himself had sought his help to see Rayaru. He, however, promised to do the needful. The next Thursday, when Rayaru appeared before Benkappa, he placed the pontiff’s request before Rayaru. Rayaru appeared a little disconcerted. He told Benkappa that till now he had come with people’s problems. Now, he wanted another person to be given Darshana. He said it was not possible and asked him to tell Bhuvanendra Theertha that he could not give darshana to him and that there was no necessity for such a Darshana at present. When Benkappa conveyed the message to the pontiff, Bhuvanandra Theertha was sorely disappointed. The next week, he once again requested Benkappa to intercede on his behalf with Rayaru. When Benkappa saw Rayaru, he once again requested him to give darshana to the pontiff. Rayaru agreed but he put a condition. He said Benkappa should not speak to the pontiff when they sit besides each other. “On no condition should you speak to the pontiff. If you do so, I shall stop talking to you”, Rayaru said. Benkappa agreed and conveyed the happy news to the pontiff. The next Thursday, both the pontiff and Benkappa sat before the Brindavana and waited eagerly for Rayaru to appear. Even as the night progressed, both the pontiff and Benkappa sat facing the Brindavana. After some time, the pontiff began dozing and soon he fell asleep. Benkappa, on the other hand, was gazing at the Brindavana with devotion. And began walking towards the Tungabhadra for his ritual bath and Pooje. When Benkappa turned towards the pontiff, he saw that the seer had dozed off and he had not seen Rayaru. He thought of waking the pontiff but remembered Rayaru’s warning. Rayaru then finished his bath and then began walking back to the Brindavana. Benkappa then tried to wake the pontiff but to no avail. He then shook the pontiff but he did not wake up. When he saw Rayaru step onto the platform on which the Brindavana was constructed. Benkappa could not control himself and he spoke to the pontiff. “Swamy, get up and look, Rayaru is getting back into his Brindavana”, he said. The pontiff was jolted awake and he only managed to see the orange robes vanish into the Brindavana. The pontiff was speechless and turning to Benkappa acknowledged his devotion. “You are truly blessed to have darshana and interaction with Rayaru”, he said. The pontiff also profusely thanked Benkappa for having helped him see Rayaru, even if it was only his robes. Benkappa was initially happy that he had managed to help the pontiff realise his wish. He, however, became pensive when he remembered Rayaru’s warning. The next Thursday and scores of Thursdays after that, Benkappa visited Mantralaya and tried to interact with Rayaru. Alas, he realised that he had forfeited a rare honor by displeasing and disobeying Rayaru. Benkappa continued to regret having disregarded Rayaru’s words. As far as the pontiff was concerned, he headed the matha for a few more years before entering Brindavana in Rajouli. To this day, Rayaru goes to the Tungabhadra for his daily bath. There have been scores of devotees who have either seen or heard of an old man going to the Tungabhadra. Another point here is that it is from this incident that Thursdays gained currency as a particular holy day for Rayaru. The seer of Mantralaya entered Brindavana on a Thursday and it was August 8, 1671. Therefore, we see a rush of devotees to Rayara Mathas on Thursdays. Raghavendra Swamy who was known as Venkatanatha in his childhood days was a much loved member of the family. He was adored by his elder sister, Venkatambe or Venkamma. His parents, Thimanna Bhat and Gopikamba, had gone to Tirumala where they had prayed for another son. The son born to them was none other than Venkatanatha. He had a brother Gururaja who was also an adept scholar of the times. After Thimanna Bhatta passed away, Venkatanatha’s mother Gopikamba took good care of Venkatanatha. Later, it was his brother-in-law, Laksmhinarayanacharya, who took him under his tutelage in Madurai where he resided and taught him Vedas and other scriptures. Venkatanatha by then had lost his mother, whom he respected and loved deeply. Though Gururaja was reluctant to send his brother to Madurai, he did so in the interest of his brother’s education. Venkatanatha was a quick learner and he learnt all that he could from Lakshminarayana. He stayed in the house of Lakshminarayana and Venkamma in Madurai. The couple looked after Venkatanatha in a loving manner. Lakshminarayanachar taught Venkatanatha all that he knw and. Venkatanatha married Saraswathi in 1614 after he returned to Kumbakonam from Madurai. in 1631 following Deekshe from Sudhindra Theertha of the Sri Matha, his wife Saraswathi was not present. It is not known if his sister was present but what we can infer is that he shared a close bond with his sister. During his travel and stay at Kumbakonam, Thanjavur, Kadalur, Madurai, Srirangam, Rameshwaram and other pilgrim places, Venkamma could get news of her brother through the Matha officials and Raghavendra Swamy’s disciples. But once he came down to Adoni in Andhra Pradesh and from there to Bichale and Gandhal in Karnataka and again to Manchale or Mantralaya in Andhra Pradesh, he had little contact with his poorvashrama sister. When Raghavendra Swamy decided to enter Brindavana on Shraavana Bahula Bidige (August 8, 1671), he did keep Dewan Venkanna and his successor Yogendra Theerth, the Matha officials informed. However, he deliberately did not inform his close devotee, Appanacharya, as he knew he would never allow the Brindavana Pravesha. We all know how Appanacharya swam across the Tungabhadra and reached the place where Rayaru entered Brindavana when the last stone slab was placed. We also know how Rayaru completed the last line of the Poornabhoda stotra that Appanacharya sang in sorrow. However, what many do not know is that Rayaru had instructed Dewan Venkanna, Yogendra Theertha and others not to completely close the Brindavana. He had sent word to Venkamma about his Brindavan Pravesha and she could not make it on time. When Rayaru discerned that Venkamma was on the way and that she would reach a little after Appanacharya came, he instructed people assembled that a small hole be left in the Brindavana. He asked the officials and Dewan Venkanna to allow his sister to come upto the Brindavana and see him in the Padmasana stage. He said the hole should be closed after his sister saw him. Venkamma had been delayed coming to Manchale. When she reached the place, she found that she was too late and that her brither had already entered Brindavan. Venkamma shed tears when the gathering told her in detail about the last few moments before Rayaru entered Brindavana. She wept aloud and called for her brother. The people gathered gently led her to the hole and told her that Rayaru had ordered them to bring her there. “Look into the hole”, they said. When Venkamma looked into the hole, she found that her brother was sitting in the Brindavan, meditating and praying. Rayaru had a rare brilliance on his face and the while Brindavana was illuminated as if there was a light. She could make out Rayaru’s features very clearly. She wondered how her brother could enter Brindavana and stay in such a calm state. Rayaru felt her presence and slowly opened his eyes. He looked at her and his eyes reflected his holiness and calmness. He smiled and raised his hands as if in benediction. Venkamma could not control herself and she called out aloud for Rayaru. She called him by his poorvashrama name and asked him to come out. It was her affection for her little brother that made Venkamma call out for Venkatanatha. In grief and umable to comprehend fully the holiness of the event, Venkamma asked Yogendra Theertha who was still standing despondently besides the Brindavana and other matha officials why they had allowed Rayaru to enter Brindavana alive. “How can you do this when my little brither is still alive”, she asked more in pain and sorrow than in anger and reason. Yogendra Theertha replied to Venkamma that they had only carried out the wishes of Rayaru and it was at his insistence that the day and date of the Brindavana Pravesha was fixed. He said they had no control or rather say in such matters and it was a decision left entirely to an individual. Venkamma remained unconvinced by the answer of Yogendra Theertha and she asked Rayaru to come out. How can you sit in that small place, she asked her brother. You cannot be comfortable and you have to come out, she insisted. Raghavendra Swamy then told her that he was more than comfortable in the place. He asked her not to worry and told her that Brindavana Pravesha was part and parcel of life and since Hari had called him, he had to heed his call. He bid her good bye and asked her to go back. “Do not worry. I am comfortable here. I have my Hari with me. I have no need for mortal things,” he said. Venkamma then went back from the Brindavana a sorrowing woman even as Yogendra Theertha stood around to ensure that the hole beneath the Brindavana was filled up. Today, the Brindavana stands as it was built 342 years ago. Thus, we see that Rayaru showed two of his miracles the day he entered Brindavana. If he showed himself in the Brindavana and completed the Poornabhoda Stotra of Appanacharya, he also showed himself in person before his sister. If one example-the Appanacharya episode-tells us that Rayaru rewards devotion, another-the Venkamma tale-tells us that he rewards true love too. No wonder, Rayaru has continued to shower his followers, disciples and even a handful of non-believers (who later became his ardent disciples) with his blessings and love. 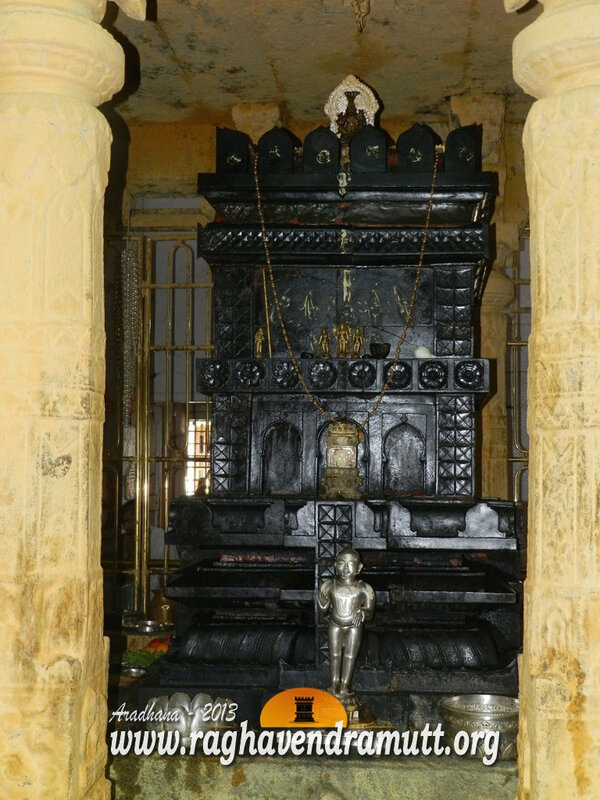 Pravesha of Rayaru. We have the Poornabhoda Stotra which was completed by Rayaru apart from the Raghavendra Vijaya of Narayanacharya and the Guru Gunavasthana which are regarded as the most authentic work on Rayaru. However, they too do not shed much light on the Brindavana Pravesha. However, information on Raghavendra Swamy, his life and works and times, his contemporaries can be gleaned from records available at that time. His descendents too are a wealth of information as is the Sri Raghavendra Swamy Matha.